ISTANBUL (Reuters) - Kurdish militants scrapped a month-old ceasefire in Turkey on Thursday, a day after President Tayyip Erdogan vowed to "liquidate" them, dashing hopes of any let-up in violence in the wake of a national election. The Kurdistan Workers' Party (PKK) militant group said the ruling AK Party, which won back its parliamentary majority in Sunday's election, had shown it was on a war footing with attacks launched this week. "The unilateral halt to hostilities has come to an end with the AKP's war policy and the latest attacks," it said in a statement carried by the Firat news agency, which is close to the militant group, based in the mountains of northern Iraq. Erdogan, who oversaw a peace process with the PKK that collapsed in July, vowed on Wednesday to continue battling the group until every last fighter was "liquidated". Twenty people were killed in clashes with the military in the mainly Kurdish southeast on Thursday, bringing this week's death toll to more than 40. More than 40,000 people have been killed in the insurgency since it began in 1984. The PKK's latest declaration, on top of the renewed surge in violence, was a fresh source of concern for foreign investors who broadly viewed Sunday's election as offering the potential for increased stability in NATO-member Turkey. However, generally weaker Turkish financial markets showed little immediate reaction to the PKK move. The PKK - designated a terrorist group by Turkey, the United States and the European Union - declared the ceasefire on Oct. 10, saying it wanted to avoid violence that might prevent a fair election. The government dismissed it as an electoral tactic. On the day the ceasefire was announced, more than 100 people were killed in a double suicide bomb attack targeting pro-Kurdish activists in the capital Ankara, and the following day Turkey launched air strikes against PKK fighters. "It is clear that a fresh halt to hostilities can only be achieved with a new will for a solution of the Kurdish problem within the Turkish state and talks aimed at such solution," the PKK's statement said. "We call on all the Kurdish people, the peoples of Turkey and democracy forces to step up their struggle." Erdogan has said the peace process, which Ankara launched with jailed PKK leader Abdullah Ocalan in late 2012, has been consigned to the "refrigerator". Ocalan last held talks with a pro-Kurdish delegation on the process in April. 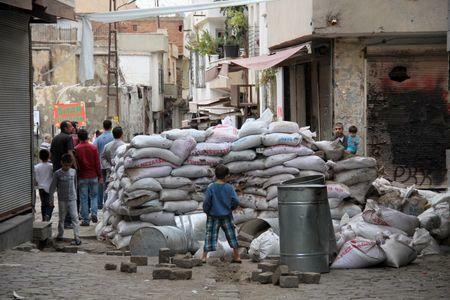 They said one soldier had also been killed in a clash with militants on Thursday in the Diyarbakir district of Dicle, which is also partly under curfew. Two militants also died in Dicle.